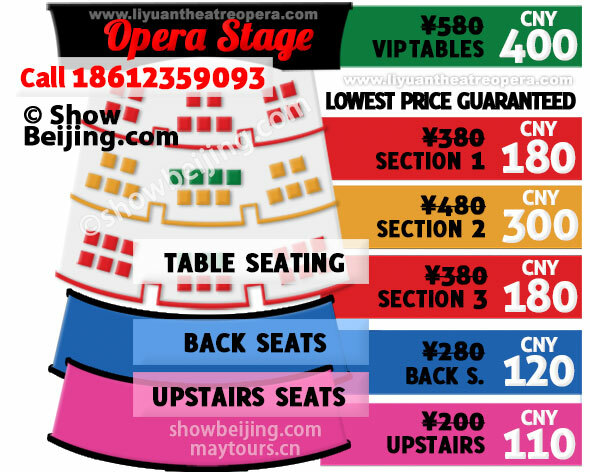 Prices are displayed per ticket in Chinese Yuan (CNY). Discount available only when purchased directly from our staff at the venue. By Subway — The nearest subway station is Hufangqiao station on line 7. A short walk to the theater. Translation: Please drive me to the Liyuan Theater, located in Qianmen Jianguo Hotel (175 Yongan Road, Xicheng District), Tel: 63016688, Thank you! By Bus — Also there are the following direct buses: 7, 14, 15, 23, 66, 70, 102, 105, 603 (Get off at: Hu Fang Qiao Lu Kou Nan) and 6, 15, 105, 687 (Get off at: Yong An Lu). Find Us at Liyuan Theatre! Please note that our staff will provide you with the tickets, the discount is not available directly from the ticket window. If you cannot find us, experience delay or cannot come, please inform us by phone, text message or e-mail. See you there! Please leave us a vote below if you have seen the performance, thank you. Fill in the booking form with show and contact details. Receive confirmation e-mail with instructions. A member of our staff will come to wait for you next to the theatre entrance. They will hold your name on a piece of paper, please pay by cash directly. Note! Booked tickets cannot be purchased from the ticket window.